The last twenty years or so have seen an incredible amount of research and development in the field of skincare. If we knew twenty years ago, what we know now about the importance of skin care maintenance, would it have made a difference to the way we looked after our skin? Imagine if we'd all avoided the sun, not smoked and made a point of drinking two litres of water every day... how much younger would we look today? On the flip side, we've built an enormous health and beauty industry to counteract our bad skin etiquette. Caring for your skin from an early age with the correct products and treatments will help delay the signs of ageing which occur as cell renewal begins to slow down. Regular exfoliation followed by moisturisation is the key to boosting cell renewal. Whatever your age, we can help you with your skincare routine with our line of professional products, designed to help you achieve beautiful skin. • How do I look after my skin in my 20s? • What skincare should I use in my 40s? • How can I look good in my 50s? How do I look after my skin in my 20s? 1. Protect your skin from the elements, making sure you use a high factor sunscreen daily or use a daily moisturiser containing SPF of at least 20. 2. Try the SkinCeuticals Ultra Facial Defense SPF 50+, it offers all that the skin needs from sun protection to effective hydration. 4. Use a moisturiser with added antioxidants such as the Jan Marini Antioxidant Daily Face Protectant SPF 30 or Heliocare 360 Gel Oil-Free SPF50. 5. Combine antioxidant moisturisers with a sunscreen - it’s the ultimate in skincare for twenty-somethings. 6. For Super Antioxidants try Medik8 Vitamin C serums. 7. Use a gentle moisturising cleanser instead of soap, as soap causes premature ageing, skin irritations and allergic reactions. 8. Don’t forget to hydrate from the inside too. Drink at least 6-8 glasses of water every day. If you smoke, think about quitting! 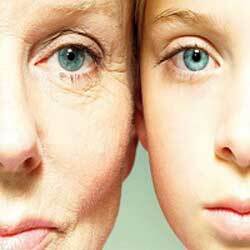 This is the age when you can start to notice the signs of ageing, as oil production decreases. For many, the first signs include fine lines, creases around the eyes begin to appear and the skin starts to show dullness and dryness. Sun worshippers may have sun spots and discolouration. Creasing of the skin from repeated muscle activity (frowning) can start to show now, with a central frown furrow, lines across your forehead and crow's feet. This is the time to make your skin work harder for you rather than letting it slow down. 1. Exfoliating your skin can work wonders at this age. Products which contain AHAs (alpha hydroxyl acids), such as glycolic acid and BHAs (beta hydroxyl acids) such as salicylic acid, increase skin exfoliation by shedding the top layer’s dull, dead cells, helping the skin to appear smoother and feel softer. 2. Try DermaTx Rejuvenate Lactic Cleanser or Jan Marini Bioglycolic Facial Cleanser. 3. Add an eye cream into your routine to help reduce the signs of lines, puffiness and dark circles. 4. This is the time to boost hydration, look for products with hyaluronic acid. You could try Dermaceutic Hyal Ceutic Intense Moisturizer. Or view more hydrating moisturisers. look at our range of hydrating moisturisers. What skincare should I use in my 40s? Once we hit our forties our fine lines become deeper, hyperpigmentation increases and the dreaded sagging begins. The skin will become visibly drier and begins to lose some of its tone and elasticity. Now is the time to energise and rejuvenate your skin, and get the glow back to reveal a youthful glow and firmness. 1. Start using more intense moisturisers and anti-ageing products which help to improve tone and texture. 2. To help lift and tighten the skin, try Jan Marini C-ESTA Face Cream or Jan Marini Age Intervention Peptide Extreme face lotion. 3. For an ultimate all in one anti-ageing product choose Jan Marini Regeneration Booster Face Lotion or AQ Skin Solutions GF Active Serum, which contain growth factors and potent antioxidants, peptides and other innovative anti-ageing ingredients to regenerate your skin. 4. Consider regular microdermabrasion, face masks and peels to refresh and revitalise your skin. How can I look good in my 50s? The down side to hitting fifty is the appearance of age spots and the lack of natural oil production. You'll see significant changes in your overall facial structure - a loss of collagen and looser skin are the culprits. Those who have exposed their skin to cigarette smoke and the sun in earlier decades will suffer the most. So you should protect and moisturise, partly to delay the onset of more lines but also because well hydrated skin looks less wrinkly. 1. iS Clinical Youth Complex or iS Clinical Youth Intensive Creme are excellent all-in-one anti-ageing moisturisers. 2. Try a Retinol at night to help stimulate cell regeneration and build collagen to diminish the appearance of fine lines, wrinkles and age spots from both photo-and intrinsic ageing. 3. Correct pigmentation problems with iS Clinical White Lightening Complex or Dermaceutic Yellow Cream - Skin Tone Brightener. 4. Hydration has never been more important. Try adding a more hydrating agent such as a hyaluronic acid, try Medik8 Hydr8 B5 Serum underneath your moisturiser. 5. Do not forget your sun protection. The most important thing at any age is water. As long as you drink between 6- 8 glasses of water a day, this will have a huge effect on your skin. It's not just about using products - it’s about caring for your skin the best you can so that it will be in better condition to accept the nutrients and protective agents you're trying to give it. You'll then see a positive difference in the way your skin reacts to your daily skincare routine.